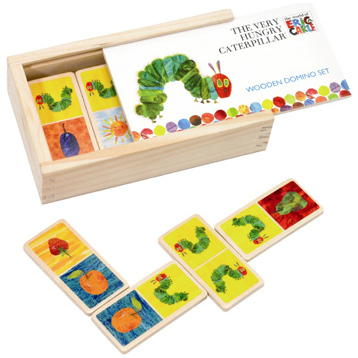 The Very Hungry Caterpillar is back, and ready to teach you the wonderful game of dominos! This traditional wooden toy is a fantastic way to get your child interacting with colours and shapes. Share the Dominos out between the players, when it’s your turn add a Domino piece that matches one that’s on the table. The first person to run out of Dominos wins! The 28 pieces come with a handy wooden container, so you can safely store them away once finished.